Although FromSoftware has been creating games for better than 20 years, most know it primarily from its Dark Souls series and/or the PlayStation-exclusive Bloodborne. Its pairing with publisher Activision feels odd on the surface given the latter’s affinity for blockbuster shooters, but the result of that alliance is Sekiro: Shadows Die Twice, another in a line of difficult titles from a developer that relishes challenging its audience. As we’ve written before, if you’re going to demand precision from gamers you’d better give them the tools to succeed. 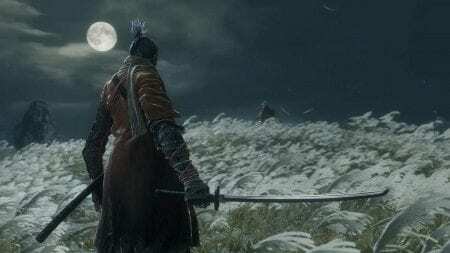 FromSoftware does so with Sekiro. Everything feels smartly mapped and works as intended, allowing you to deftly move between grapple points, sneak up behind enemies, deflect blows and more. Our lone complaint structurally is that we’d sometimes lose our lock-on for no obvious reason, resulting in some anxious moments. At the heart of combat is a system built on breaking an opponent’s posture where you attempt to open them to a killing blow rather than slash away for damage. This is done via a mix of attacking and defending with properly timed deflections serving as the most effective way to expose a foe for the kill. Finding the sweet spot with an enemy’s attack takes practice, and if you’re too late you’ll absorb a hit — blocking wards off blows, but your own posture erodes with each strike. Stealth is also an option for large of sections of gameplay, allowing to kill unsuspecting enemies with a single hit if you can get within range without alerting them to your presence. Enemy A.I. can often be pretty clueless in this regard, failing to become aware as you impale a fellow guard well within their peripheral view. Given how difficult the game is in other areas, however, we appreciated any edge we could get. Beyond swordplay, Sekiro also features a prosthetic limb that allows you to grapple through the environment and utilize various tools, three of which can be equipped at a given time. These add variety to the fighting, and most have a particularly effective purpose — such as the loaded ax breaking shields or the firecracker frightening animals. It’s a strong overall setup, and one that provides the means necessary to overcome the game’s high difficulty. Running on a PS4 Pro, Sekiro looks good but is by no means a showcase game in the vein of God of War or Red Dead Redemption II. Enemy types recycle liberally with modest changes between many whereas the best efforts are saved for the bosses. Environment and level design rate as solid, allowing for exploration while keeping things moving forward. Its performance isn’t great, however, with the frame rate hovering below 60 fps even on the more powerful Pro. All voice acting is in Japanese, which is something we’ve always enjoyed from series like Yakuza and various Puroresu games. The dramatic inflections are effective here as well, bringing some emotion to a fairly threadbare story. Other aspects of the soundscape do their job from the satisfying clashing of steel to the spraying of blood. Set in Japan circa the 16th century, you control Wolf, a royal bodyguard that has failed in his duties to protect the Divine heir, Kuro, who is sought because his blood holds incredible power. After being reanimated and fitted with a prosthetic limb by The Sculptor, you set about righting this wrong by defeating any who stand between you and Kuro. Once you find him, however, things get even more interesting. While it’s not a great story, it’s a narrative step up from the Souls series, providing motivations for Wolf and many of the NPCs you encounter. There’s a definite order for how to proceed, though the game does offer some freedom, and we spent many an hour revisiting areas and grinding for money, items and experience. As you progress, you’ll come across idols that serve as checkpoints, allowing you to return there at any point as well as resting, which both recoups all health and potions but at the cost of repopulating the world with previously defeated enemies (not including bosses). Dying will send you back to the most recent point at the cost of half your money and experience (though you’ll never “de-level”). And die you will, a lot. As the title implies, Sekiro includes a resurrection mechanic that allows you to come back from death, but fall again and you’re back to the idol. Excessive deaths cause “dragon rot” to spread to the world’s NPCs, preventing you from progressing in any of their side missions. You’ll also lower the possibility of unseen aid, which allows you to keep the EXP and coin you would’ve otherwise lost. Initially, we struggled mightily in Sekiro, but, like the best games of this ilk, it taught us how to get better, and enemies we once only dared assassinate from the shadows were cut down head on. The game also rewards your willingness to go off the beaten path with upgrades of vitality, damage, technique and your prosthetic limb. That’s not to suggest it ever gets easy, however. It doesn’t, at least not for us. While most of the consternation stems from the steady flow of bosses (both full fledged and sub), common foes can also exact a toll if they get you hemmed in or overwhelm you with numbers. Yes, deaths at their hands become less and less common as you go, but even whittling away your health can be an issue when you need every ounce for a boss. In general, Sekiro does an excellent job of presenting challenging but fair combat, but it does run into some troubles with its camera when locked on fighting indoors against multiple foes or sub bosses than can pressure you into corners. It doesn’t happen a lot, thankfully, though it did rear its ugly head enough to warrant calling it out. If you’re looking for a challenging, occasionally frustrating yet ultimately rewarding experience, Sekiro: Shadows Die Twice has you covered. Clementine’s goal us to protect AJ — not just physically, but emotionally in a world gone to hell. Thus the episode’s first major segment pits Clem in full Rick Grimes mode, all while AJ is watching. It’s clear that the resulting actions will leave an impact on the young child, leaving a moral quandary that is TellTale at its best. From a story perspective, there are two big issues here — the fallout from AJ’s mistake (both between him and Clem, and the pair within the larger group) and the lurking surrounding raider clan that Marlon traded group members to. These storylines fuel each other, pushing beats forward as they swap the spotlight. Probably the single biggest gameplay difference between this and the WWE 2k games is that Fire Pro encourages you to create exciting matches by emphasizing grading, whereas the WWE games are more akin to a fighting game. Here you might kick out late in a count or allow the A.I. to mount a comeback in the interest of crowd favour.